Luxury brand management is becoming more demanding as time goes by, though it remains an extremely buoyant economic sector. This profession is looking for newly graduated students, who are attracted by this demanding universe, where know-how and people-oriented skills are key components to success. The Luxury Goods Management major trains future managers who will be ready to take over complete departments, who will be in charge of pathbreaking services, exclusive products and profitable markets for key clients and the privileged few in this area of the Hospitality Industry. Taking this into account, the M5 year studies current and future trends, and of course does not neglect international management strategies. Revenue Management has now become a necessity in hotel and tourism management. This new administrative method allows sales to be more correctly monitored and managed. It is a new way of managing pricing. A Revenue Manager works on understanding markets and optimizing revenues. This specialization allows students to meet customer expectations, to anticipate their behavior and to affect their purchases with the goal of generating increased profits. This technique uses new communication and information systems without however playing down the quality of human relationships as well as fundamental values held by the Hospitality Industry. The Events Management major targets students who are extremely motivated by communication and marketing, who are able not only to be creative, but also to do precise and exacting work when managing a team. When choosing this major, they will be able to schedule, organize, lead and manageall activities linked to special events, however small or large they may be. They will acquire knowledge in management, finance, marketing and human resources in order to analyze and propose a product that is perfectly in line with the event taking place. 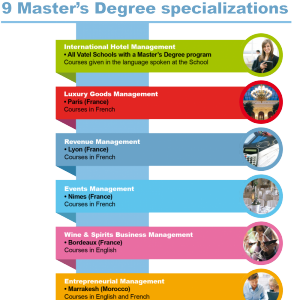 The Wine Business Management specialization is dedicated to the students willing to work as senior managers in the hospitality and gastronomy businesses where wine is an issue, those who plan to embrace a career in the wine and spirits world and the wine enthusiasts who aspire to improve their knowledge for personal reasons. The Entrepreneurial Management major trains professionals who understand issues linked to the entrepreneurial spirit in the Tourism and Hospitality field,who make the right decisions to ensure their competitive advantage in the marketplace. The American Hospitality Management and International Business major teaches students the Anglo-Saxon management methods that are driven by results and understanding of new technologies. It gives them the tools that are required for a career as an international leader in the Hospitality industry anywhere in the world. This program was designed in a way that allows students to think out-of-the-box and become decision-makers: leadership and entrepreneurship, business management, strategic marketing, new trends in the Hospitality industry, etc. The Resort Management major trains senior executives in the international hospitality industry to work in companies that include, outside of traditional hotels and restaurants: spas, golf courses, leisure activities, theme parks, etc. Managing a resort means understanding and controlling a highly complex organization whose constraints are often heightened by its location (in a desert, a savanna, on an island, in the heart of a big city, etc.). This major teaches students to understand operational, financial and strategic logic pertaining to each type of entity. They will be required to work in a “handson” way for marketing or human resource missions with professional partners. The Human Resources Management and Training major teaches students to establish strategies in human resources thanks to an innovative and unique programme in Switzerland, prepared by consultants highly specialized in their field of expertise including the former VP HR EMEA of Hyatt International. Students gain state-of-the art knowledge in hiring situations and the development of programs allowing to retain talent and optimize internal organization, as well as reduce a very expensive turnover of staff. The program includes academic periods, projects and simulations, but also immersions in real-life situations in two cities of Switzerland.